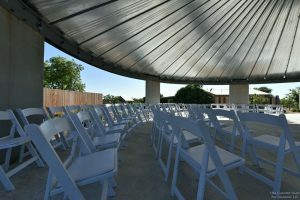 Fredericksburg in central Texas is a wonderful place for outdoor weddings; but there are things to consider. First, of course, is the weather. Texas weather can change very fast. Storms can pop up and blow through in a matter of hours and unfortunately they can’t be predicted. So the most important part of an outdoor wedding in Texas is ‘Plan B‘. Chose a venue with a covered site option and avoid the stress of a potential disaster. The second weather issue here is sun. We get lots of sunshine! It’s beautiful but can be hot. Be sure your site has adequate shade for all your guests. It only takes a few minutes in the heat for people to sweat through their good clothes, or even worse, get sick. Heat stroke is very real and very dangerous. Also consider your ground surface. Side walks and pathways make the walk easier for everyone. Pastures, hills and rocky areas can be difficult for the elderly, the overweight and anyone in high heels. It can even affect the way the chairs set and nobody likes wobbly chairs. If the wedding is late in the evening, be sure to check the sunset times for your date. It stays light here well into the evening in the summer, but you may still need additional lighting for the ceremony. Consider upgrading your outdoor wedding to a covered site like our 40’ gazebo. Open on all sides, and set in a beautiful garden of flowers, Gilbriar Gazebo offers rain protection, shade, firm surfaces and lighting for a luxurious outdoor wedding.